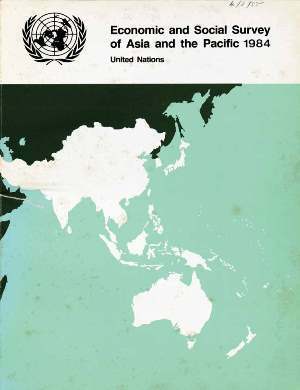 This is the thirty-eighth annual Economic and Social Survey of Asia and the Pacific (until 1974 entitled the Economic Survey of Asia and the Far East). As in previous years, the Survey 1984 is presented in two parts. Part one contains a survey of recent economic and social development in the region in the context of the world economic situation. Part two is devoted to an analysis of problems of financing development in the countries of the region. The process of world economic recovery which started in 1983, after the worst recession in half a century, now appears to have gained considerable momentum. Some persistent concern about the strength and universality of the recovery notwithstanding, the international environment in the short term seems significantly less harsh than in the early 1980s. However, the recession has left some undesirable imprints yet to be effaced. Restrictions to the free flow of world trade continue, real interest rates in world capital markets remain high in spite of slight declines very recently and sluggishness in the demand for primary commodities persists. In addition, the net inflow of external resources to developing countries from both official and private sources has declined or stagnated. Despite these problems, developing economies of the region have continued to achieve relatively robust rates of economic growth. Economies in which exports of manufactures were an important component of final demand were buoyed up by the rise in demand abroad; a rise in output in the agricultural sector, favoured by good weather, helped others. But, skilful economic management as reflected in fiscal prudence, monetary restraint and flexibility in responding to volatile external conditions appeared to be the more significant factor in the reasonably good economic performance in the region. The economies which fared less well were those heavily dependent on primary commodity exports, the least developed countries and the island countries in the Pacific subregion. For improved performance in the economies of these countries, larger external assistance on suitable terms remains an urgent necessity. In the aftermath of the recession, financing development has emerged as a critical problem in all developing countries. With the flow of external resources slackening and external debt burdens increasing, the task of mobilizing domestic resources has become formidable, but all the more necessary. The developing countries of this region have quickly recognized the nature of the emerging problems and initiated various remedial measures. These include policies for the development of the financial sector with reforms in interest rate regimes, financial institutions and fiscal incentives. Governments also have undertaken measures to raise government revenue and better control government expenditure as well as to improve efficiency in public enterprises. The analysis in part two, while examining these and other reforms, seeks to identify areas for further improvement. In addition, the analysis points to the need for increasing the flow of resources to developing countries of the region to complement their efforts in mobilizing domestic resources. Like previous Surveys, this issue is published on the sole responsibility of the secretariat. The views expressed do not necessarily reflect those of the Commission or of the Governments of its members and associate members.